Regarding tag scheme for highway, trunk are more important that primary. 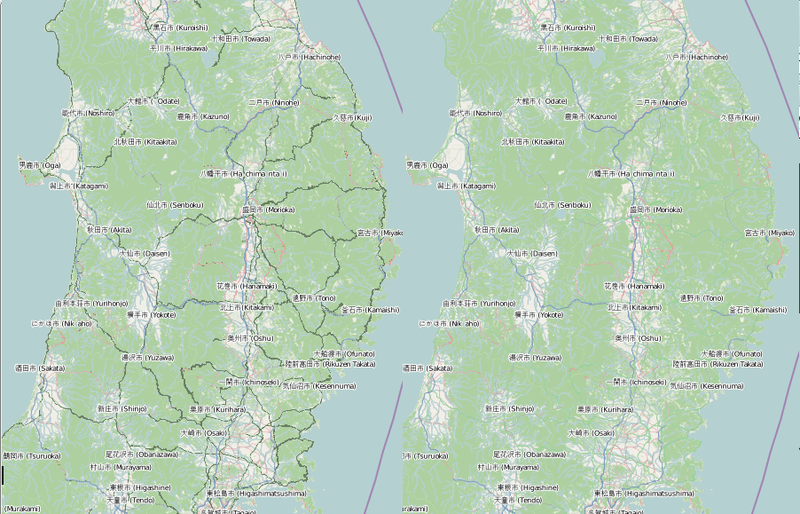 But using OSM rendering (using mapnik of osmarender) trunk are render in green. This green is not visible when the highway is in a landuse area with lot of forest or vineyard. In some area you see primary (red) and motorway (bleu) but intermediate trunk are hidden. I some location it's not a problem (no forest drawn) but the green continue to be more proeminent than primary (red). I think the green color (used also by osmarender and cloudmade) is not the most appropriate ; green is a widly used color for landuse and natural. Perhaps another color for trunk or a really dark green ? I compare the color scheme with some other (commercial) and no one seems to use green for highway : only variations around red, yellow, white, black, grey and blue. Some commercial map used two color for big highway (like motorway and trunk) : red/blue, red/yellow, blue/red... stripping on the perpendicular direction of the highway : its seems really fine and expressive for big road. 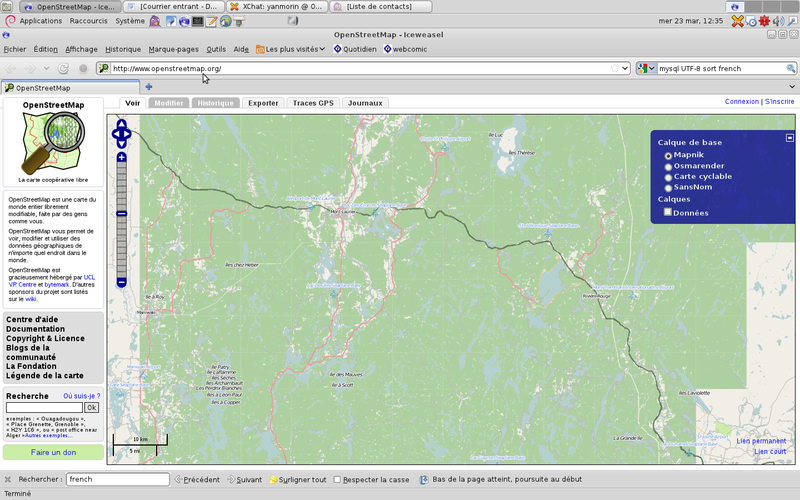 We have the same problem in Quebec and Ontario and with others provinces since we can now import Canvec (official national data in osm format) data into OpenStreetMap. I agree this is a problem. Mentioned on IRC today. It's particularly bad at zoom levels <10 when there is no casing rendered. e.g. ​here in Japan at z11 the green roads a pretty much invisible at the moment. progysm suggests making trunk roads darker, which might work, but we don't want them a yucky dark bottle green colour. Making landuse colours paler would also help. I reckon the map would look better if all landuse had lighter less powerful colours. OsmAnd ​http://osmand.net/ draws trunks with red-violet color #de1042 (OSM Vector Maps, Day mode). These trunks are visible in forest, even during driving. Maybe this red-violet is good for trunks in Mapnik too? "I compare the color scheme with some other (commercial) and no one seems to use green for highway"
You mean apart from Ordnance Survey, Mapquest, and ViaMichelin?, all of whom use green for UK trunk roads (I just checked)? I've not checked all commercial maps around the whole world, i just said "some other ... no one seems" ; but i just also checked and MapQuest? and ViaMichelin? use red for highway for France map. And yes, around London they use green but i also note that forest in a very light green and highway remain very visible, no problem. The problem a initially describe is a visibility problem between highway and forest, not a green problem.
) and they do they display forest in a very light green, so red on light green is very visible, no problems. This issue is now being discussed on Github: ​https://github.com/gravitystorm/openstreetmap-carto/issues/102 Therefore, I will close the issue here.